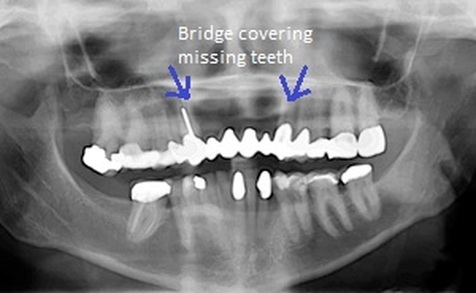 A fixed bridge is used to replace missing teeth. A bridge helps to create a normal bite, prevent stress on the dental arch, prevent the drifting and tilt of adjacent teeth, inhibit decay in difficult areas, and slow the onset of periodontal disease. A dental bridge can be an often great option for someone missing one or more teeth in a particular area. Sometimes called a “fixed partial denture” bridges literally bridge the gap between missing teeth. Unlike a removable denture, a dental bridge can only be removed by the dentist. Another option is an Implant Bridge. When several teeth in an area are missing and a traditional crown bridge is not an option, an implant bridge may be a great alternative. An implant is placed to hold the bridge in place.